The S.C. Drought Response Committee, meeting via conference call on July 16, has upgraded the drought status of the entire state. Previously on June 19 the committee had designated 28 counties to the first level of drought. Those counties are now in the second or moderate stage of drought. 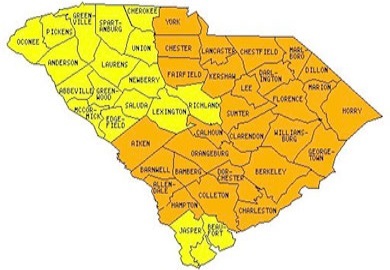 The counties upgraded to the moderate stage of drought include Aiken, Allendale, Barnwell, Bamberg, Berkeley, Calhoun, Charleston, Chester, Chesterfield, Clarendon, Colleton, Darlington, Dillon, Dorchester, Fairfield, Florence, Georgetown, Hampton, Horry, Kershaw, Lancaster, Lee, Marion, Marlboro, Orangeburg, Sumter, Williamsburg and York. All other counties in South Carolina are now in the first level of drought or incipient. The purpose of the moderate declaration is to increase awareness that drought conditions are intensifying. Water systems are asked to review their Drought Response Plans and Ordinances and implement as needed. "Duke Energy strongly supports the Drought Committee's moving the drought classification to moderate based on the very low stream flows, dry soil moisture and widespread low rainfall amounts over the last 30 days. Duke Energy is concerned with lake levels and is carefully managing hydroelectric operations under these conditions," stated George Galleher, principal engineer with Duke Energy. According to Hope Mizzell, SC State Climatologist, “Rainfall totals within each county are highly variable, for example in York County some areas are reporting less than 2” since June 1 while others have received over 7”. Since our last Drought Committee meeting in mid-June, rainfall totals have decreased statewide. The drought impacts have been intensified due to the much above normal temperatures." Drought Response Committee Chairman Ken Rentiers stated, "The Committee will continue to monitor the situation closely and if conditions deteriorate the S.C. Department of Natural Resources will reconvene the committee as needed.